Simplified operation, minimum maintenance and long, economical service are a few of the advantages you get with an ARR Series analog 3 phase charger. Three-phase ARR chargers have 208, 240 or 480-volt input. DC outputs are either 130 volts at 50 to 500 amps or 260 volts at 25 to 250 amps. All ARR chargers, regardless of size, use the same plug-in printed circuit boards. This minimizes parts inventory and simplifies maintenance. DC float voltage is maintained within ±0.5% from no load to full load with input frequency variations of ±5% and with ac input voltage variation as shown. The current limiting circuit is factory set at 105% and is adjustable from 75% up to 115%. It will hold down to short circuit. The typical power factor varies from 66% at +10% AC line to 80 percent at –10% AC line under full load conditions. Electrical Noise (Filtered Chargers) Filtered to 100mVrms when connected to a battery with an eight hour capacity rating of four times the charger DC current rating. Electrical Noise (Unfiltered Chargers) Nominal ripple is approximately 3% rms on unfiltered units when connected to a battery with an eight hour capacity of four times the charger DC current rating. All three-phase filtered ARR chargers can be operated on a principally resistive load with the battery disconnected for maintenance purposes. The RMS ripple will be greater than with the battery connected. All three-phase ARR chargers can beoperated in parallel with other constant potential chargers having similar regulation characteristics of the same nominal DC output voltage. 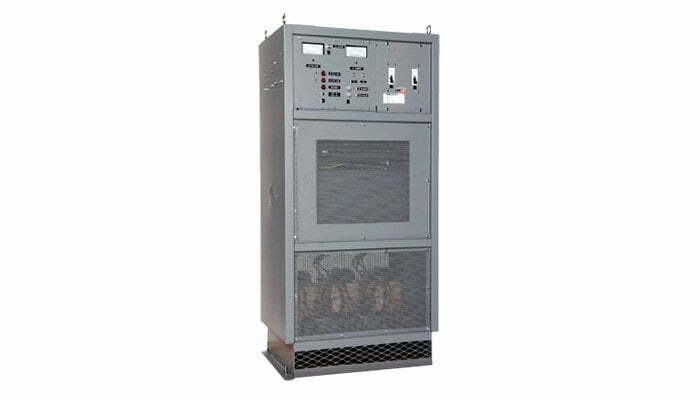 A three-pole AC input circuit breaker is provided on all models. A two-pole DC circuit breaker is provided in the output circuit. The AC power fail alarm closes a single-pole Form C contact to operate a variety of local or remote alarms in the event of an AC failure. An adjustable DC high-voltage shutdown relay shuts down the charger if it senses a voltage above its set value. Two, multi-turn potentiometers provide the adjustment range. Selection is made with a toggle switch. The DC ammeter and DC voltmeter have 3.5-in (89-mm) cases, 2.9-in (74-mm) scales and 2% accuracy. Three-phase ARR chargers will operate at current limiting continuously in temperatures from 32F to 122F (0C to 50C). These units can be stored for up to one year at temperatures ranging from -40F to 185F (-40C to 85C). Electrostatically applied, baked epoxy powder finish (ANSI-61 gray) resists scratches, nicks, acid, and corrosive fumes. All models are natural convection cooled. All models are floor mounted. Low DC Voltage Alarm Relay – Alarm operates when the charging voltage falls below a pre-set level. Available with time delay. High DC Voltage Alarm Relay – Alarm operates when the charging voltage goes above a pre-set level. Available with time delay. Equalize Timer (with indicating light) – 0-255 hour timer replaces float-equalize switch. Charger automatically returns to float at end of time interval. DC No-Charge Alarm Relay with forced load sharing – DC no-charge alarm relay with forced load sharing operates when charger DC output current is less than 2 percent of rated output. Provides load sharing within ±5% for all three-phase ARR chargers with the same nominal DC output voltage and current. Recommended when chargers are operated in parallel. One Percent Accuracy Meters – both voltmeter and ammeter have same size scale and case as standard two percent meters. Summary Alarm Relay – The summary alarm relay combines the signals from several individual alarms and activates if one of the alarms is activated. DC Ground Detection Relay – Operates when resistance from output to ground is less than 10,000 ohms. Can be used for either remote or local indication. Ground Detection Lights with Two Push-Button Switches – Shows whether ground is in (-) or (+) output line. Ground Detection Momentary Switch - Disconnects DC voltmeter from output circuit and measures voltage to common ground. Lightning Protective Device – Provides added input protection against lightning-induced transients. Drip Shield -Protects charger from dripping water without interfering with convection cooling.